The Miner Swim Team has had to make some adjustments this year. The San Manuel Pool is under repairs so the team is practicing at the Mammoth Pool. Despite the logistics challenges, the team has had many good practices including work in the weight room. The team is in shape and ready for competition. The Girls Swim Team comes off a 9 win season in 2017 (which equals the most in team history) and hopes to continue its winning ways in 2018. Senior Darien Apuron brings back 3 years of experience at the State Championship Meet and looks to earn her way back again this year and improve on her top 10 finish in the 100 Butterfly from last year. Senior Bonnie Bridges brings experience in the Freestyle events. Junior BaiLee Hill returns with experience in the Backstroke and Distance Freestyle events. Sophomore Star Chavez was part of the Miner Relay team that finished 12th at the State Championship Meet last year and hopes to make it back again this year. Sophomore Alyssa Riekofski showed tremendous improvement in her first year of swimming and looks to pick up where she left off. Freshman Rianna Estrada is an anticipated addition to the team who is very good in all competitive strokes. The Boys Swim Team comes off a 6 win season in 2017, which was an incredible result with only 4 swimmers. All four boys return in 2018. Senior Michael Primero-Predgo earned a spot at the State Championship Meet last year in both the 100 Freestyle and 100 Backstroke. Senior Daniel Garcia looks to improve on last year’s successes in his 50 Free and 100 Butterfly. Sophomore Evan Apuron returns after finishing 5th in both the 200 Individual Medley and the 100 Breaststroke at the State Championship Meet, he is swimming very fast right now, and hopes to be battling for a spot on the podium this year. Sophomore Jayden Smith returns bigger, stronger and faster this year, he is capable and willing to take on any race that the coaches put him in. Freshman Hunter Hill is the new addition to the team and he has been showing tremendous potential in practice. 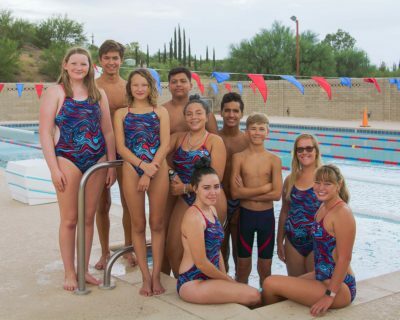 The Miners first meet of the season is against Palo Verde on Thursday, Aug. 30, at the Terra Del Sol Pool at 4 p.m.